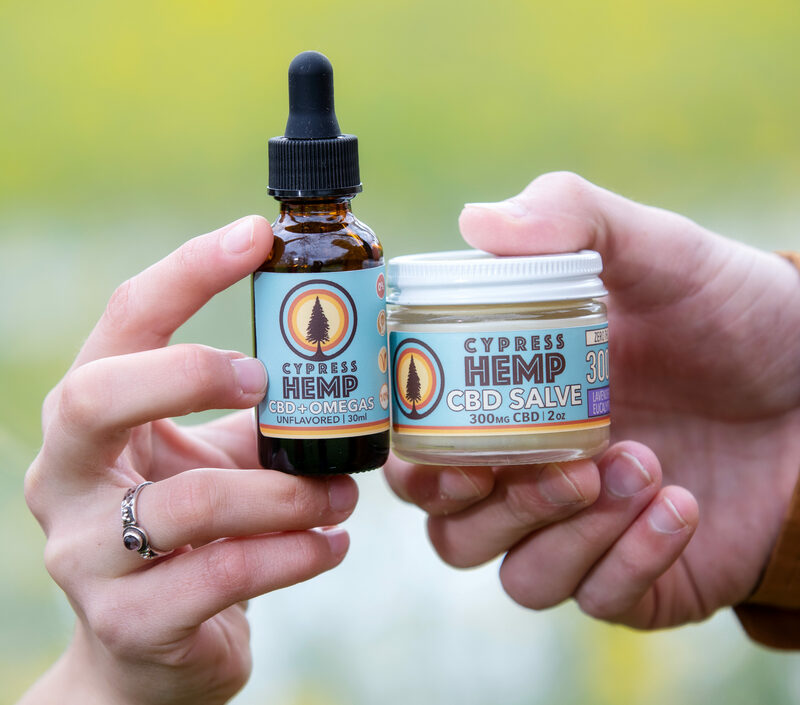 Kristy Hebert and Blake Bilger started sustainable hemp company Cypress Hemp in 2018 to offer CBD and hemp goods as healthy alternatives to medical and industrial products. Photos by Collin Richie. Kristy Hebert’s life was changed forever when she was hit by a drunk driver her freshman year at LSU. Hebert was walking down Nicholson Drive in 2012 when the driver struck her while making an early turn into an apartment complex. In an attempt to flee the scene, the driver ran over Hebert, rolling over her mid-section seven times before shattering her pelvis. After the accident, she was hospitalized for more than six months. She sat out of school for two semesters of rehabilitation treatment where she re-learned how to walk. After a month of recovery, Hebert was frustrated with the grogginess she felt from the pain medicines she was prescribed. She began researching natural alternatives for chronic pain and was intrigued by the benefits of cannabidiol, also known as CBD oil. CBD oil can be used to relieve health conditions like anxiety, insomnia, loss of appetite, acne, chronic pain, depression and epilepsy. CBD oil made from hemp is legal, and it has grown in popularity in recent years. Most CBD products do not contain THC, so unlike marijuana, they are nonpsychoactive. Despite what her doctors recommended, Hebert switched from taking prescription pain medicine to CBD oil for her pain. After placing a couple drops of the oil under her tongue a few times a day, she noticed instant pain relief and mental clarity. Since then, Hebert has been on a mission to educate people on the health, economic and industrial benefits of the hemp plant. Last September, she and her partner, Blake Bilger, started Cypress Hemp, a sustainable hemp company that makes CBD and hemp products. “I think to create the social and legislative change, you need to have those products in people’s hands,” Bilger says. 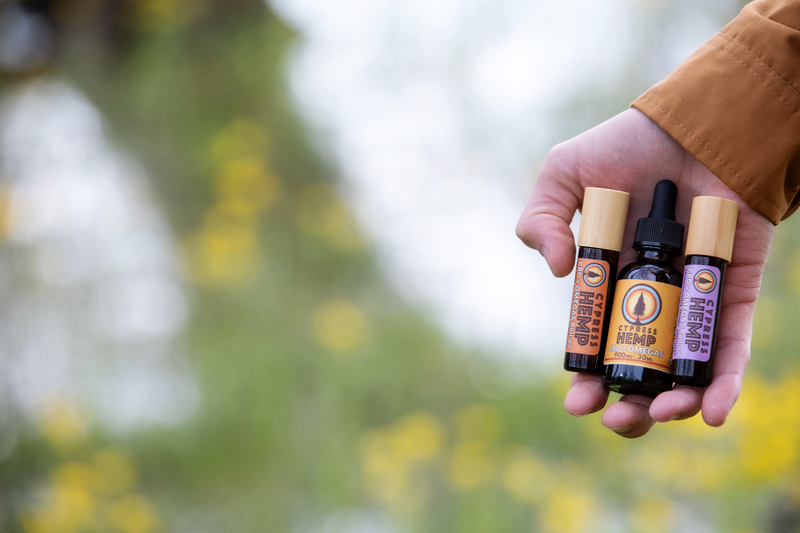 Since CBD is extracted from the hemp plant (which is illegal to grow in Louisiana), the Cypress Hemp team partnered with cannabis farmers in Colorado to produce their oils. After the CBD and hemp seed oil is extracted from the plants, the oil is shipped to Baton Rouge where Hebert and Bilger package and ship their products around the nation. Cypress Hemp sells CBD softgels, oils, roll-ons; lavender and eucalyptus salve; and hemp T-shirts. Cypress Hemp sells CBD softgels, oils, roll-ons; lavender and eucalyptus salve; and hemp T-shirts. All of its plant-based products are sold on its website, but shoppers can find the brand locally at Coyote Moon, Aurora 225: CBD & Hemp, Yoga Bliss and every month at the Mid City Makers Market. To further its mission of providing sustainable alternatives, 10% of the company’s profits are donated to neuroscience research and nature conservation. Ultimately, Cypress Hemp wants to become a full-scale hemp company. The team plans to expand more into industrial uses of the hemp plant such as textiles and Hempcrete (an insulating material made of hemp hurd, limestone and water). Also, they plan to incorporate their CBD oils into dishes at local restaurants, Bilger says. This article was originally published in the April 2019 issue of 225 Magazine.